Look around the stores and St. Patrick’s Day seems to be about lucky clovers, rainbows and leprechauns. But the real Saint Patrick was an amazing and bold missionary who faced tremendous danger to take the gospel back to his enemies. This is a great opportunity to explore the Trinity, missions and celebrate the legacy of the real Saint Patrick. 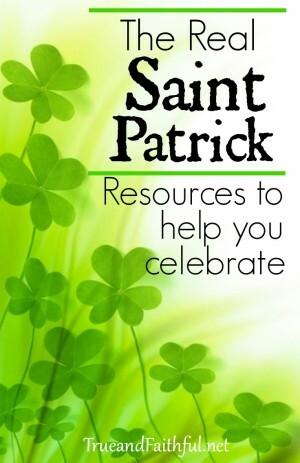 This post is chock-full of activities and resources but first, let’s look at the story of the St. Patrick. Fun fact: Patrick was not Irish and not born not in Ireland. He was actually born in Roman Britain in the mid-400’s, in the area of Scotland or Wales. He grew up on a farm and though his family was active in the village church, Patrick was not a believer. When he was 16, Celtic pirates from Ireland landed on the British coast. They raided his farm while the rest of his family was away and took young Patrick captive. Sailing back to Ireland, they sold Patrick as a slave and for six years, he served as a shepherd. He later wrote that alone and suffering, he prayed a hundred times a day, and was converted to Christ. At 22, Patrick escaped and walked 200 miles to the sea. Making his way through France and across Britain, he finally found his way home. Once reunited with his family, though, Patrick felt God calling him to return to the very place he’d been enslaved. He felt called to bring the gospel back to the Irish, immersed in pagan, Celtic worship without Christ. Patrick returned to Ireland and immediately faced the hostile Celts. Despite numerous threats on his life, Patrick continued to share the gospel and eventually established churches all across Ireland. By his death 33 years later, it’s said that almost the entire island had converted to Christianity. Patrick of Ireland was a world-changer. His life is one of suffering and forgiveness, obedience and bravery. St. Patrick’s boldness to return to his enemies with the hope of the gospel is the story we should be celebrated on March 17.
by Tomie dePoala. This is a great book for younger children. Check to see if your library carries this one! by Michael McHugh for older elementary through high school. This book makes a GREAT read aloud. We’re listening to the audible version this year. For teens and adults. Not to be missed, this is an exciting narrative about St. Patrick’s influence on Ireland and the entire western world. As Rome collapsed and the dark ages prevailed, Irish monks tucked away in monasteries preserved the Bible as well as valuable Greek and Roman literature which would flower again during the Renaissance. One of my top recommendations for high school. This is a selection from Thomas Cahill’s longer book on St. Patrick that sorts fact from myth and tells the true story of this amazing missionary. For young children, this short Veggie Tales production tells the real story of St. Patrick in a fun way. 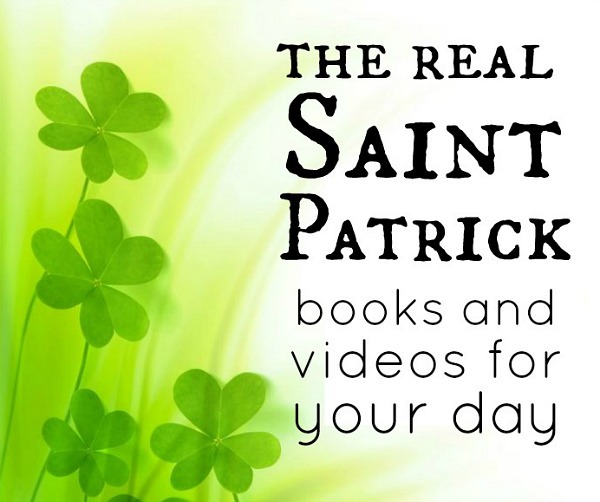 Elementary and up will enjoy this short video produced by the Christian Broadcasting Network about the life of Saint Patrick. It’s well done and historically accurate. For a full-length family movie night, this film is available for instant rental or free for Amazon Prime members. Use the shamrock to teach the Trinity with this fun coloring activity. 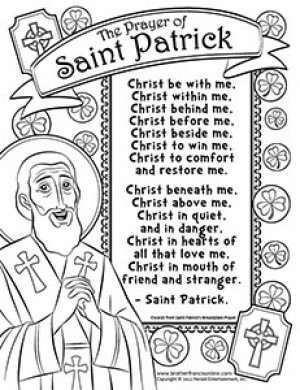 Here’s another coloring page with the prayer of St. Patrick. 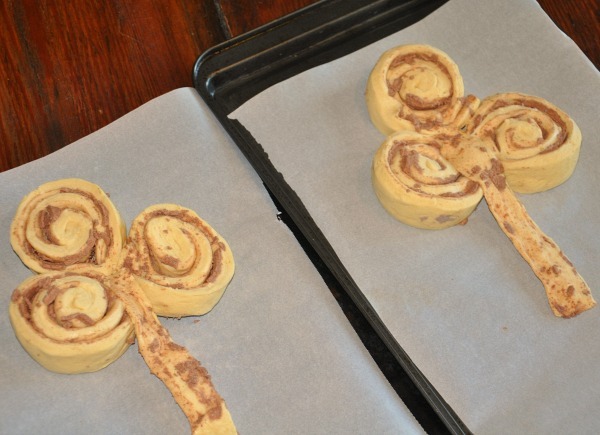 Use cinnamon shamrocks to talk about the Trinity. 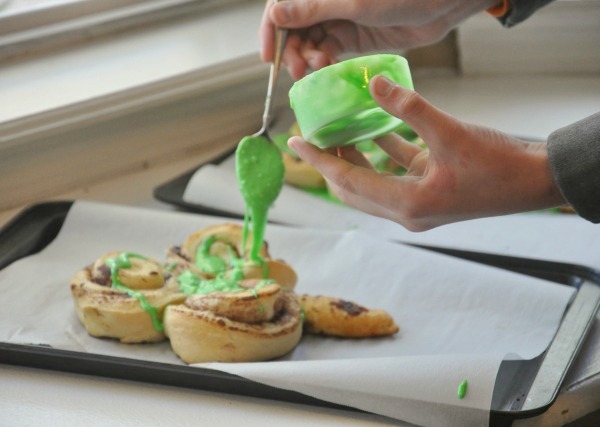 We used refrigerated cinnamon rolls and added green food coloring and a few drops of milk to get a drizzly, shamrock green frosting. 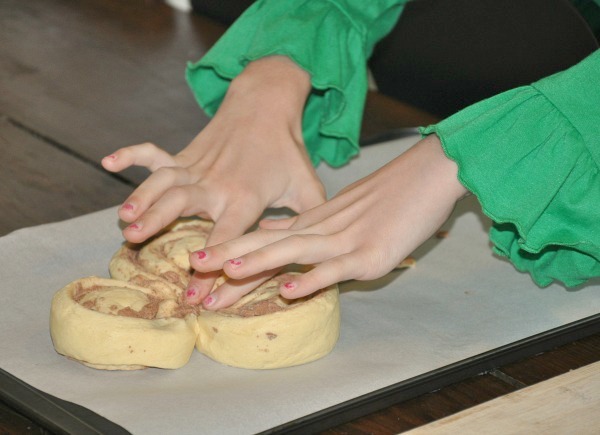 As we shaped the shamrocks, we talked about the Trinity — that God is three persons in One. The three petals of the shamrock represent the Father, Son and Holy Spirit. I explained that the shamrock isn’t a perfect analogy of the Trinity and that no earthly representation will ever be a perfect image of the Trinity. But each illustration helps us understand a bit more. Christ did not hesitate to use the plural form when speaking of Himself along with the Father and the Spirit. “We will come unto him and make our abode with him.’ Yet again He said, ‘I and my Father are one.’ It is most important taht we think of God as Trinity in Unity, neither confounding the Persons nor dividing the Substance. 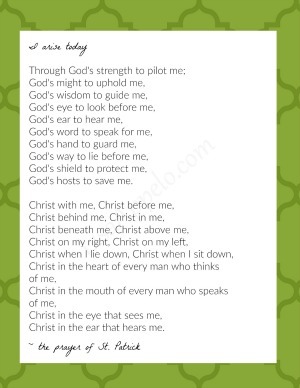 St. Patrick is famous for his lorica, his prayer of protection. No wonder these beautiful words have been preserved through the ages. 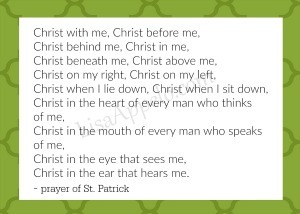 I created two printable St. Patrick’s prayers and they are free to download and print. Click on each image to download. Finally, if you want to dig into St. Patrick’s original biography, this site has Saint Patrick’s Confession. It’s a short read, but the only original writing of St. Patrick’s still around today. And this site is like a virtual museum trip with some of the most famous artwork that depict Saint Patrick. So, yes, I’m all for wearing green and pinching those who don’t on St. Patrick’s. We’ll eat our corned beef on March 16 and celebrate our Irish history. But we’ll also celebrate the real St. Patrick and his amazing legacy for Christianity. So glad to meet you at Titus 2 Tuesdays and see all these great resources. I shared a book today at the link-up that our family has used as a St. Patrick’s season read-aloud (or reader for older kids), and it beautifully portrays the history of the real Patrick while also explaining some of the legends that have grown up around his life. Michele, I’ve read at least one other Madelaine Polland book. I had not realized she wrote Flame Over Tara about Saint Patrick. Glad to know this one is out there as well! Thanks for visiting. Thank you Jennie. I’m glad to have found the online videos for this year! Good to know! I admit, I’ve never stopped to think about the real story of St. Patrick either. Thanks for sharing all of these resources! Really enjoyed the film. Thank you for sharing it. I’m familiar with the books for younger children & have used them but would love to get my hands on a copy of How the Irish Saved Civilisation. Thanks for the reminder as it had slipped my mind. How the Irish Saved Civilization sounds a bit dry but it’s a fascinating read. This was a great post. 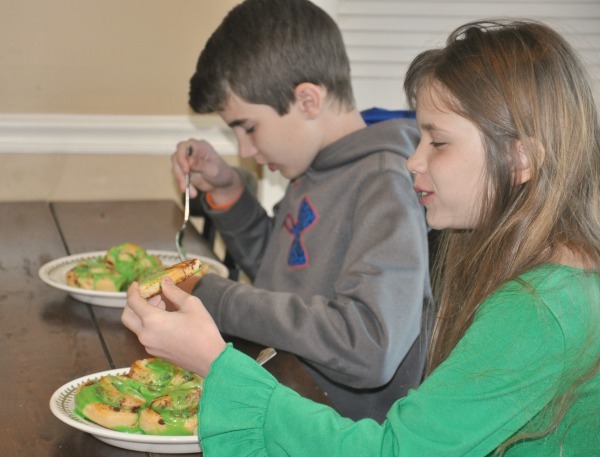 I am setting up our St. Patricks day festivities and I am so glad to have these ideas. Thank you for visiting, Chrissy! True, Paris Renae. I’ve been at this for 18 years and reminding myself to find the fun helps us keep going. The older years get so serious so fast. I wanted to print the prayer, but it goes to dropbox and nothing comes up. Am I doing this right? I would love to print it. Thanks so much for sharing. I loved this educational piece. St Patrick’s Day is a holiday I never paid much attention to until we moved to Tampa and lived a block from an Irish pub. It is quite the celebration. Isn’t it interesting how many of our long celebrated holidays have their roots in Christianity? I am going to share that cute video with my first grade Sunday School class. Thanks Lisa! What a great, resourceful post for St. Patrick! Thanks for sharing it #PorchStories at my place this week. Thank you so much for sharing! I love these resources! I missed this last week! I’m a diehard Tomie dePaola fan and didn’t know he had a book on St. Patrick. The book for teens and adults looks great too. Thanks so much for gathering all these resources for us. I am so excited to find your post. My oldest is 11 and we’ve never celebrated St. Patrick’s Day. I didn’t feel like it was worth it with mostly frivolous, silly traditions (especially since we have two birthdays in March and usually celebrate the first day of Spring.) I don’t know if I’ll have time to get our hands on the books this year, but we’ll definitely spend more of March learning about St. Patrick and having fun with shamrocks next year. 🙂 Thanks for taking the time to compile the history and research for us! Lisa, this was so refreshing to find as I prepared my own lesson on St. Patrick. Amidst the silly St. Patricks crafts, it was so refreshing to see this Christian History out there… and to see how you developed this and suggested so many great resources. Also … have you heard of the The Story of St. Patrick, More than Shamrocks and Leprechauns, published by the Voice of the Martyrs? It is such a good story. Maybe one more to add to your collection. It’s the one I shared with my class today … you can read more about it here, ttps://www.chroniclesofmomia.com/p/the-story-of-st-patrick.html. I haven’t but I’m also happy to learn of great new books. Thank you for the recommendation! Also … have you heard of the The Story of St. Patrick, More than Shamrocks and Leprechauns, published by the Voice of the Martyrs? It is such a good story. Maybe one more to add to your collection. It’s the one I shared with my class today … you can read more about it here, https://www.chroniclesofmomia.com/p/the-story-of-st-patrick.html. I added a link to your site as well, am planning to grab some of these books from the library in the next few days.